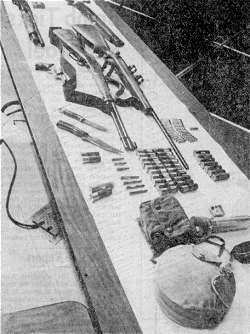 Fugitives Claude Dennis and Michael Lancaster were armed with the weapons shown in upper left photo when they confronted four Oklahoma Highway Patrolmen in gun battles May 26 in Bryan County. 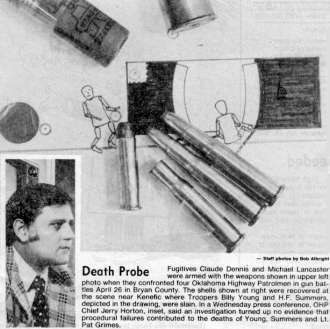 The shells shown at right were recovered at the scene near Kenefic where Troopers Billy Young and H.F. Summers, depicted in the drawing, were slain. In a Wednesday press conference, OHP Chief Jerry Horton, inset, said an investigation turned up no evidence that procedural failures contributed to the deaths of Young, Summers and Lt. Pat Grimes. Photos and caption from the Daily Oklahoman, July 27, 1978.